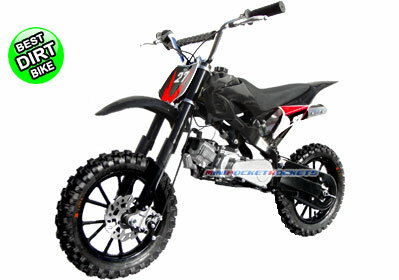 KTX Radical dirt bikes are the top-of-the-line of all 4-Stroke mini dirt bikes. Measuring longer and taller than any other mini dirt bike, the KTX was designed to tackle the toughest of terrains and the roughest of trails. If you are looking for the pinnacle of the smaller mini dirt bikes, look no further! With an Extra-Long travel Full Suspension System, the highest ground clearance and ultra-aggressive off road knobby tires, the KTX Radical will take you deep into uncharted territory and back. Larger upsized powder-coated rims and a heavy duty off-road braking system gives the rider confidence with stability and safety. The space-age frame is even more heavy duty now. With a beefier front fork and an extended rear swing arm, this gas powered dirt bike can jump small cliffs and ledges and just keep going and going. The Honda®-Based 4-STROKE Engine is completely sealed from the elements, so you can ride these mini dirt bikes through trails, mud, sand, light snow or anything else you may encounter. 4-STROKE engines inherently have more torque and more horsepower than 2-stroke motors. You can even take them into the concrete jungle for some all-out pavement racing. Whether you are a full-grown adult or you're just getting this dirt bike for kids, the KTX Radical will carry your weight just the same. The dual transfer case is geared to deliver more than enough torque to move any rider in to and out of any terrain. The seat is deeply padded and is extra-long to accommodate riders from 6'2 down to 3' tall. The fairings and mud guards are made from ABS Plastic, which is both flexible and virtually indestructible! With the adjustable speed governor, top speed can be regulated from 5-35 MPH to accommodate all skill levels. We've also pre-installed our exclusive HD Off-Road Package in our KTX Radical Dirt Bikes which includes flip-down metal foot rests, all steel gas tank and an easy recoil pull starter. This line of mini dirt bikes includes decals and an optional ABS chain guard and padding. All you need to do is attach the wheels, snap on the mud guards, adjust the handlebars and you're ready to fill up the gas tank and blaze new trails. The KTX Radical knows no boundaries. Are you ready to tame this beast? Included Free with Mini Dirt Bikes: Bike Kick Stand, Owner's Manual, Tools, Tool Case, Motor Oil Bottle, Starter Stickers and our free extended warranty.